The Messerschmitt Me 264 was a long-range strategic bomber developed during World War II for the German Luftwaffe as its main strategic bomber. The design was later selected as Messerschmitt's competitor in the Reichsluftfahrtministerium's (the German Air Ministry) Amerikabomber programme, for a strategic bomber capable of attacking New York City from bases in France or the Azores. Three prototypes were built but production was abandoned to allow Messerschmitt to concentrate on fighter production and the Junkers Ju 390 was selected in its place as a maritime reconnaissance aircraft. The Me 264 was the first aircraft in the world with integrated wing fuel tanks, a standard for most modern aircraft. The origin of the Me 264 design came from Messerschmitt's long-range reconnaissance aircraft project, the P.1061, of the late 1930s. A variant on the P.1061 was the P.1062 of which three prototypes were built, with only two "engines" to the P.1061's four, but they were, in fact, the more powerful Daimler-Benz DB 606 "power systems", each comprising a pair of DB 601 inverted V-12 engines, successfully used in the long-range Messerschmitt Me 261, itself originating as the Messerschmitt P.1064 design of 1937. The DB 606's later use, and badly designed engine installations in the Heinkel He 177A's airframe design managed to get them derided by Reichsmarschall Hermann Göring as "welded-together engines" in August 1942. In early 1941, six P.1061 prototypes were ordered from Messerschmitt, under the designation Me 264. This was later reduced to three prototypes. The progress of these projects was initially slow, but after Germany had declared war on the United States, the Reichsluftfahrtministerium (RLM) started the more serious Amerikabomber programme in the spring of 1942 for a very long range bomber, with the result that a larger, six-engine aircraft with a greater bomb load was called for. To meet this demand, proposals were put forward for the Junkers Ju 390, Focke-Wulf Ta 400, a redesign of the unfinalized and unbuilt Heinkel He 277 design — itself only receiving its RLM airframe number by the February 1943 timeframe — to give the Heinkel firm an entry in the Amerikabomber program later in 1943, and a design study for a six-engine Messerschmitt Me 264B, prompted by the ongoing inability for Germany's aviation powerplant designers to create reliable powerplants of 1,500 kW (2,000 PS) and above power output levels that thwarted efforts to do the same with just four engines instead. As the Junkers Ju 390 could use components already in use for the Ju 290 this design was chosen. The Me 264 was not abandoned, however, as the Kriegsmarine (German navy) separately demanded a long-range maritime patrol and attack aircraft to replace the converted Fw 200 Condor in this role. This was reinforced by an opinion given by then-Generalmajor Eccard Freiherr von Gablenz of the Wehrmacht Heer (German Army) in May 1942, who had been recruited by Generalfeldmarschall Erhard Milch to give his opinion on the suitability of the Me 264 for the Amerikabomber mission; von Gablenz echoed the Kriegsmarine's later opinion. As a result, the two pending prototypes were ordered to be completed as development prototypes for the Me 264A ultra long-range reconnaissance aircraft. The Me 264 was an all-metal, high-wing, four-engine heavy bomber of classic construction. The fuselage was round in cross-section and had a cabin in a glazed nose, comprising a "stepless cockpit" with no separate windscreen section for the pilots, which was common for most later German bomber designs. A strikingly similar design was used for the B-29, of slightly earlier origin. The wing had a slightly swept leading edge and a straight trailing edge. The empennage had double tail fins. The undercarriage was a retractable tricycle gear with large-diameter wheels on the wing-mounted main gear. The planned armament consisted of guns in remotely operated turrets and in positions on the sides of the fuselage. Overall, it carried very little armour and few guns as a means of increasing fuel capacity and range. The Me 264's first prototype was originally fitted with four Junkers Jumo 211 inverted V12 engines using the then-new Kraftei (or "power-egg") unitized powerplant installation as standardized for the earlier Ju 88A Schnellbomber, but inadequate power from the Jumo 211 engines led to their replacement on the Me 264 V1 first prototype with four similarly unitized 1,700 PS (1,250 kW) BMW 801G engines. In order to provide comfort on the proposed long-range missions, the Me 264 featured bunk beds and a small galley complete with hot plates. Me 264 V1 undergoing flight-testing. The first prototype, the Me 264 V1, bearing the Stammkennzeichen factory code of RE+EN, was flown on 23 December 1942. It was powered at first by four Jumo 211J inline engines of 990 kW (1,340 hp) each. In late 1943, these were changed to the BMW 801G radials which delivered 1,290 kW (1,750 hp). Trials showed numerous minor faults and handling was found to be difficult. One of the drawbacks was the very high wing loading of the Me 264 in fully loaded conditions at some 356 kg/m2 (73 lb/sq ft); comparable aircraft, such as the Boeing B-29 Superfortress at 337 kg/m2 (69 lb/sq ft) wing loading, the redesign of the He 277 for its intended production priority to fulfil the Amerikabomber role at 334.6 kg/m2 (68.5 lb/sq ft) and Ju 390 at 209 kg/m2 (43 lb/sq ft), had lower wing loading. The wing loading caused poor climb performance, loss of manoeuvrability, stability and the need for high take-off and landing speeds. This first prototype was not fitted with weapons or armour but of the following two prototypes, the Me 264 V2 had armour for the engines, crew and gun positions, although it was decided to complete the Me 264 V2 without defensive armament and vital equipment and the Me 264 V3 was to be armed and have the same armour. In 1943, the Kriegsmarine withdrew their interest in the Me 264 in favour of the Ju 290 and the planned Ju 390, with the Luftwaffe preferring the unbuilt Ta 400 and the Heinkel He 277 as Amerikabomber candidates in May 1943, based on their performance estimates, stopping any further payment for development work to Messerschmitt AG for its design. In October 1943, Erhard Milch ordered the cancellation of further Me 264 development, to concentrate on the development and production of the Me 262 jet fighter-bomber. Late in 1943, the second prototype, Me 264 V2, was destroyed in a bombing attack. On 18 July 1944, the first prototype, which had entered service with Transportstaffel 5, was damaged during an Allied bombing raid and was not repaired. The third prototype, which was unfinished, was destroyed during the same raid. Following the cancellation of the competing He 277 in April 1944, on 23 September 1944, work on the Me 264 project was officially cancelled. Messerschmitt proposed a six-engine version of the Me 264, the Me 264/6m (or alternately Me 364), but it was never built. ^ "Messerschmitt Me 264." luft46.com. Retrieved: 26 February 2008. ^ Smith and Kay 1972, p. 550. ^ Griehl, Manfred; Dressel, Joachim (1998). 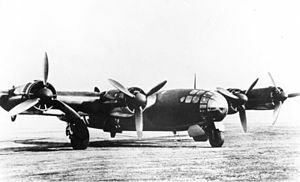 Heinkel He 177 - 277 - 274. Shrewsbury, UK: Airlife Publishing. p. 186. ISBN 1-85310-364-0. ^ a b Green 1970, p. 641. ^ Smith and Kay 1972, p. 552. ^ Creek & Forsyth 2007 p. 35. Neitzel, Söhnke. Der Einsatz der Deutschen Luftwaffe über der Nordsee und dem Atlanti, 1939–1945 (in German). Nordrhein-Westfalen, Germany: Bernard & Graefe, 1995. ISBN 978-3-7637-5938-5. Smith, J. Richard. Messerschmitt: An Aircraft Album. New York: ARCO Publishing Company, Inc., 1971. ISBN 978-0-668-02505-8. Wikimedia Commons has media related to Messerschmitt Me 264. This page was last edited on 20 February 2019, at 14:45 (UTC).